I’ve made roast turkey at least 15 times in my life. I know that might not qualify me as a turkey roasting expert, but I am definitely an expert in turkey experimentation. I used to try different recipes and techniques every Thanksgiving, always searching for the “holy grail” recipe that would have everyone oohing and aahing over my turkey roasting prowess. I’ve basted. I’ve injected. I’ve stuffed. I’ve rubbed. I’ve marinated. I’ve massaged. I’ve brined. None of the turkeys I made were ever bad, but they weren’t amazing either. I basically gave up thinking that roast turkey could be anything other than a fairly bland, slightly dry, obligatory holiday meat that only truly tasted good when doused in salt, pepper and gravy, and scooped up in a heaping forkful of mashed potatoes. Two years ago, however, I finally found my holy grail: THE DRY BRINE! What shocked me more than the deliciousness of the dry-brined turkey was that it was also the easiest roast turkey recipe I’d ever tried. You can had an herb or two if you’d like, but these are the essentials. I wish someone had told me about this easy technique back when I was wrestling a slippery, raw 20 lb turkey into a tub of liquid, or hovering next to the oven for five straight hours with a basting brush in my hand. Most brines we think of are wet brines, which involve immersing the turkey into a giant vat of liquid that contains sugar, salt and other ingredients (cue the aforementioned turkey wrestling). Dry-brining simply involves coating the turkey in a few tablespoons of kosher salt and letting it sit in the refrigerator for up to two days. Don’t let the simplicity fool you, though. Dry brining results in the juiciest, most flavorful turkey I’ve made in 15 years of making turkeys. The idea of a dry brine seems counterintuitive since salt is typically associated with drying foods out, not making them juicier. But dry brining actually adds moisture to the meat. In layman’s terms, the salt draws moisture from the meat into the skin and then through osmosis (literally), the salty moisture reworks itself back into the turkey, ensuring that the meat is seasoned all the way through. If you want more info on how this works, here is some additional info about the science behind dry brining. Ideally your turkey should be thawed before you apply the brine. If you’ve bought a frozen turkey, it will need to thaw in the fridge for a few days (allow 1 day per 4 lbs); and after you apply the salt you’ll want to let it brine for at least 1 hour per pound, but it can go as long as 2-3 days. The nice thing about dry-brining is that even if your turkey isn’t fully thawed when it’s time to brine it, you can brine it anyway! To give you an example of my timeline: I bought an 11 lb frozen turkey on a Thursday morning, put it in the fridge to thaw, applied the brine on Sunday morning, and cooked it on Monday afternoon. Measure out approximately 1 tablespoon of kosher salt per every 4 pounds of turkey (I used a little less than 3 tbsp for my 11 lb turkey). TIP: I used the Diamond Crystal brand of kosher salt, but if you’re using Morton kosher salt you might want to use a little less. 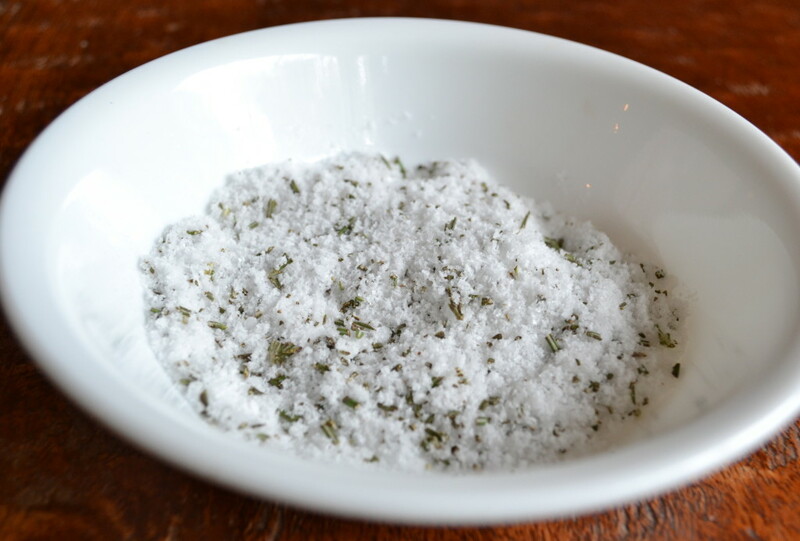 It’s not essential to use herbs, but if you’d like to add some (I used rosemary), finely chop about 1 ½ teaspoons of your herb of choice and add it to the salt mixture. Start by sprinkling a little of the salt mixture into the cavity of the turkey, and then distribute the remaining salt over all surfaces of the turkey, concentrating slightly more on the meatiest parts. 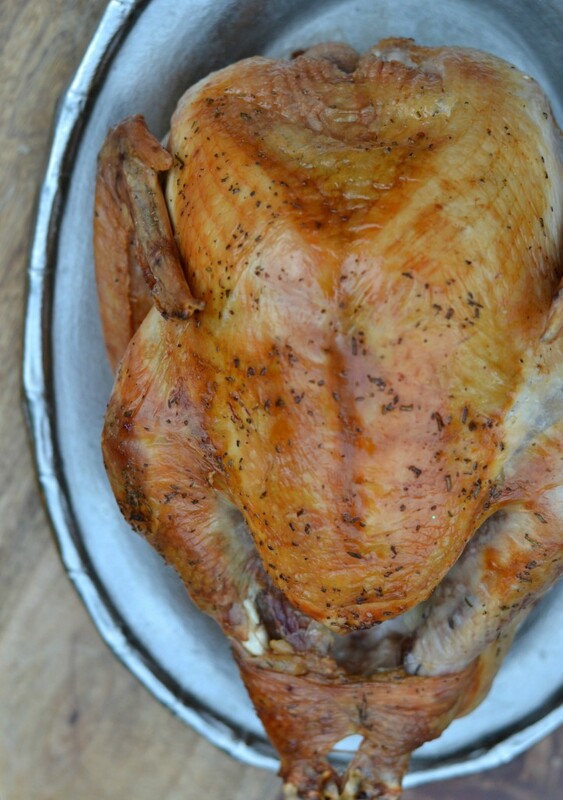 Place the brined turkey on a platter and place uncovered into the refrigerator. As I mentioned in the last step, you should aim to let it brine for at least 1 hour per pound of turkey, but you can leave it for up to 48 hours. I brined mine for about 24 hours. Over time, the skin will start to look a little brownish and dried out, but that’s OK. Remove the turkey from the refrigerator and let sit at room temperature for about 1 hour. Cook the turkey breast side down on a rack inside a roasting pan at 425° for 30 minutes. After the 30 minutes is up, flip the turkey over (use oven mitts to do this) so that it’s breast side up, and reduce the oven temp to 325°. Cook for 2 ½ more hours, or until a meat thermometer reaches 165° when poked into the thickest part of the meat. Depending on the size of your turkey, you may need to cook it a little longer. If you’d like, you can baste the turkey with a little butter sometime during the cooking process, but it’s totally optional. I basted mine once with about 2 tbsp of butter, and that was it! 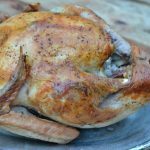 Dry-brined turkeys require less cooking time, so keep in mind that your turkey might be done sooner than other similarly-sized turkeys you’ve cooked in the past. That said, one of the great things about dry-brining is that even if you overcook the turkey a little, it will still be juicy and tender. 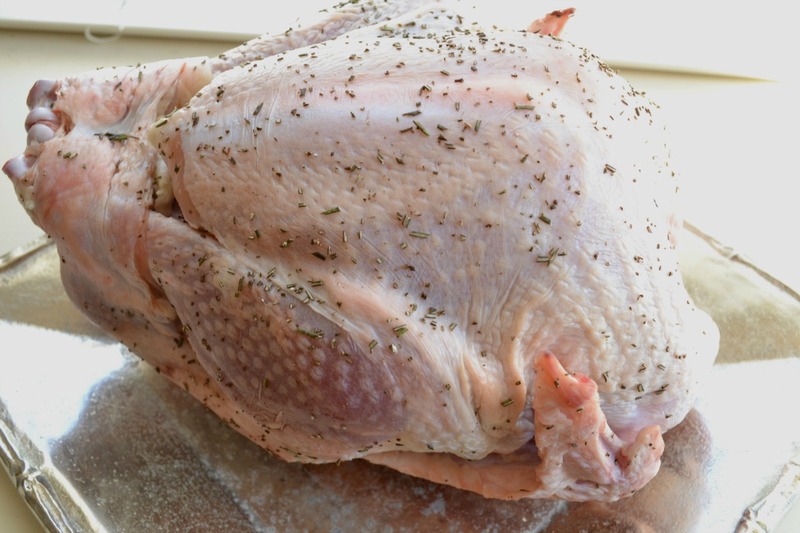 Do not use the dry-brining technique with a stuffed turkey or the stuffing will get too salty. You also should not do this with a kosher turkey since it comes pre-salted. 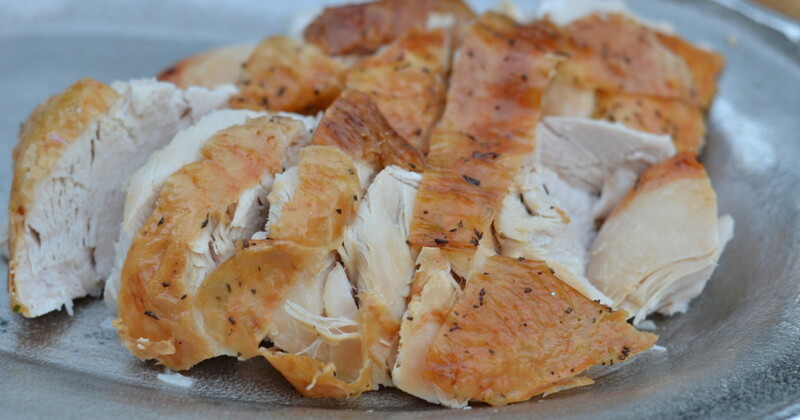 Dry-brining is such simple technique, and it results in a moist, flavor-packed roast turkey. Remove giblets, and rinse & pat dry your turkey. Measure out approximately 1 tbsp kosher salt per 4 lbs of turkey and place in a small bowl. If using herbs, stir 1 1/2 tsp diced herbs into the salt. Sprinkle a little salt into the cavity of the turkey. 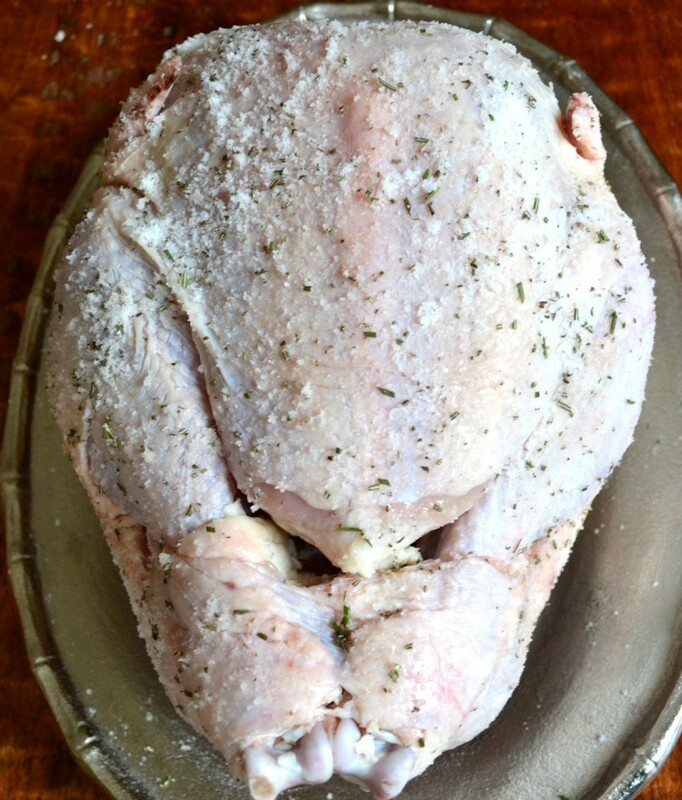 Distribute the remaining salt over all surfaces of the turkey, concentrating a little more on the meatiest areas. 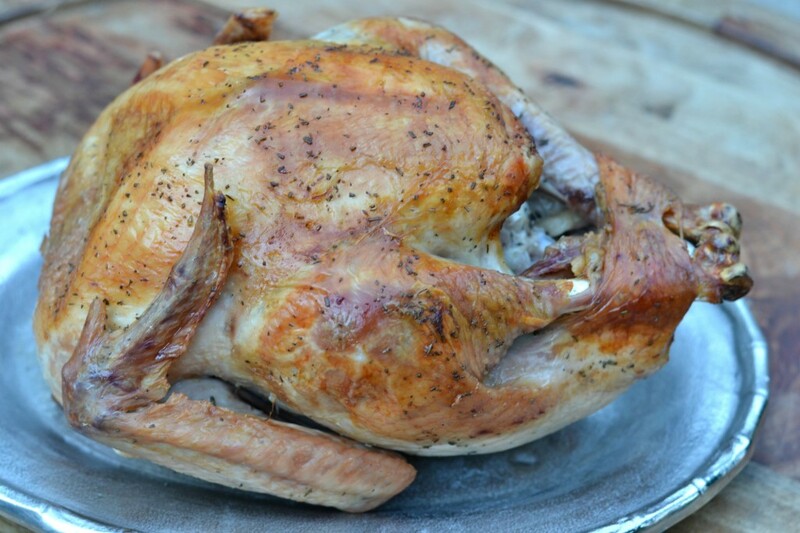 Refrigerate turkey on an uncovered platter for at least 1 hour per pound, but up to 48 hours. An hour before you're ready to cook, remove turkey from refrigerator and let sit at room temperature. Preheat oven to 425. Place turkey breast side down on a rack in a roasting pan. Cook for 30 minutes. Reduce temperature to 325. Flip turkey so the breast side faces up and return to oven. Cook for about 2 1/2 more hours or until internal temperature at the thickest part reaches 165. Let rest for about 30 minutes, carve, and serve. This recipe is honestly the most fool-proof one I’ve ever tried, and the most delicious. If you try it, make sure to come back and tell me what you think! I used this method yesterday for just a turkey breast, and without a doubt, this is the best turkey I’ve had. My family all agreed! I used what drippings were in the pan, added some water and flour and a little chicken broth and had plenty of gravy. So glad I tried your recipe and directions….so thanks! By far the best and moistest turkey I have ever made. Simply delicious! The drippings were a little salty for gravy so I put a raw, cut up potato in the gravy for about 10 minutes while cooking to soak up the salt and the gravy was delicious as well. Thank you for posting this, it’s a keeper for sure! Just to be clear, no rinsing before baking. Don’t want to ruin a 20 lb. bird. Thank You! !